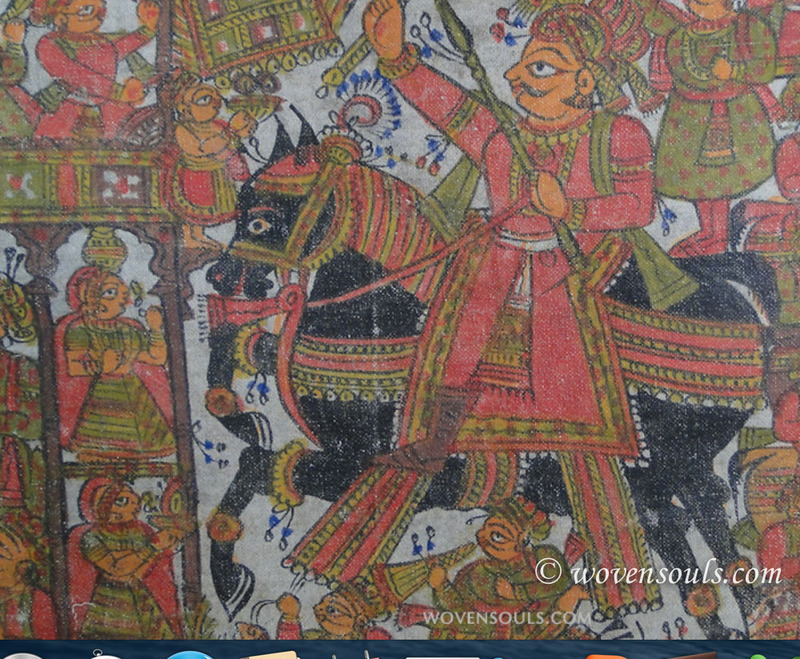 Am studying my Phad (Par) textiles and enjoying the complex scenes painted in. 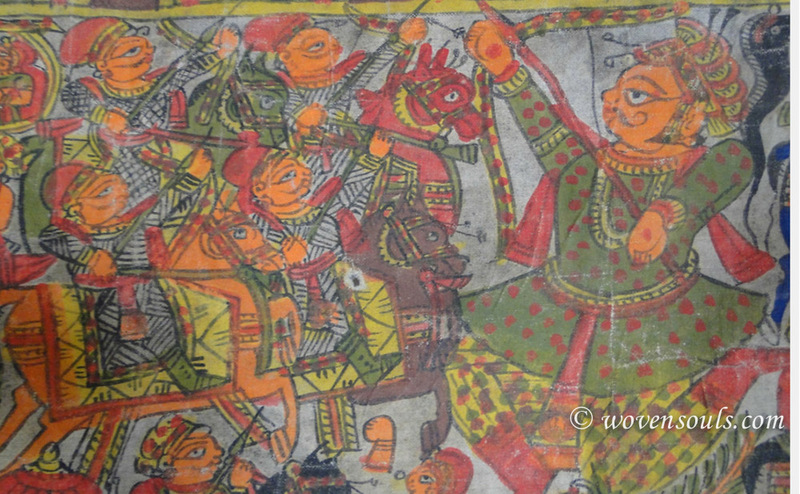 There are two types of Phads: one narrating the legend of Pabuji and the other narrating the legend of Devnarayan. All Phads belonging to one group are identical in the sequence of scenes and the story depicted in each scene. Although this may seem like a rigid constraint limiting the artist’s creativity, once we see several Phads, it is clear that no two Phads are identical. Each has its own character. While some stand out simply because the lines are more graceful or the color palettes are more appealing, others are outstanding because the artist pours his soul into the painting. As a result, while the overall painting looks like the others as the macro elements are similar, the micro details in each of the macro elements are rendered in a captivating way. For textile lovers, one such micro detail that delights the eye and the mind, is the range of costume and textile patterns seen in some Phads. The Pehran (the long shirt), the turban, the Patkaa (sash) the cushion, the baithak (seat) covers are all beautiful textiles! 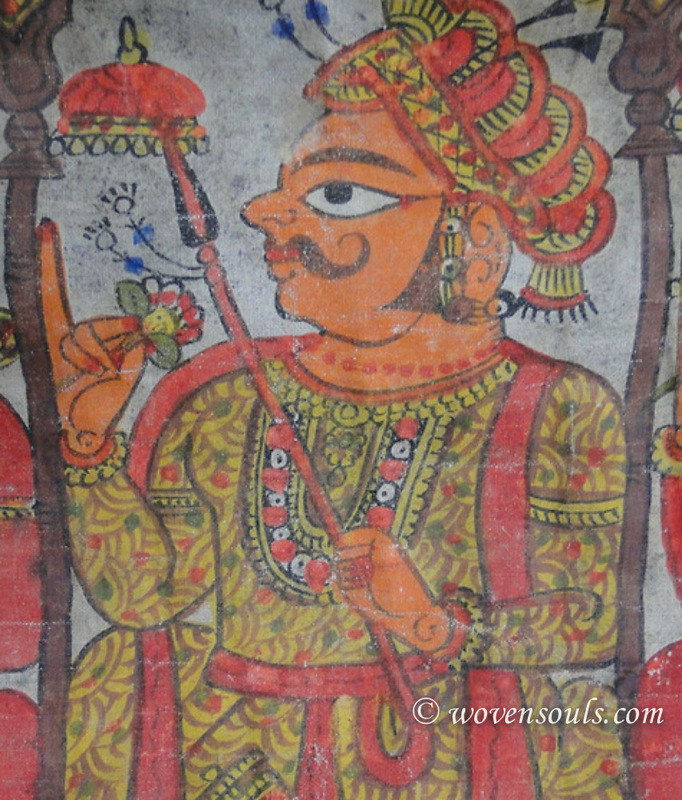 As I stare at these pictures of the costumes I wonder about the format of these beautiful motifs – are these prints or are they embroideries or are they weaves? 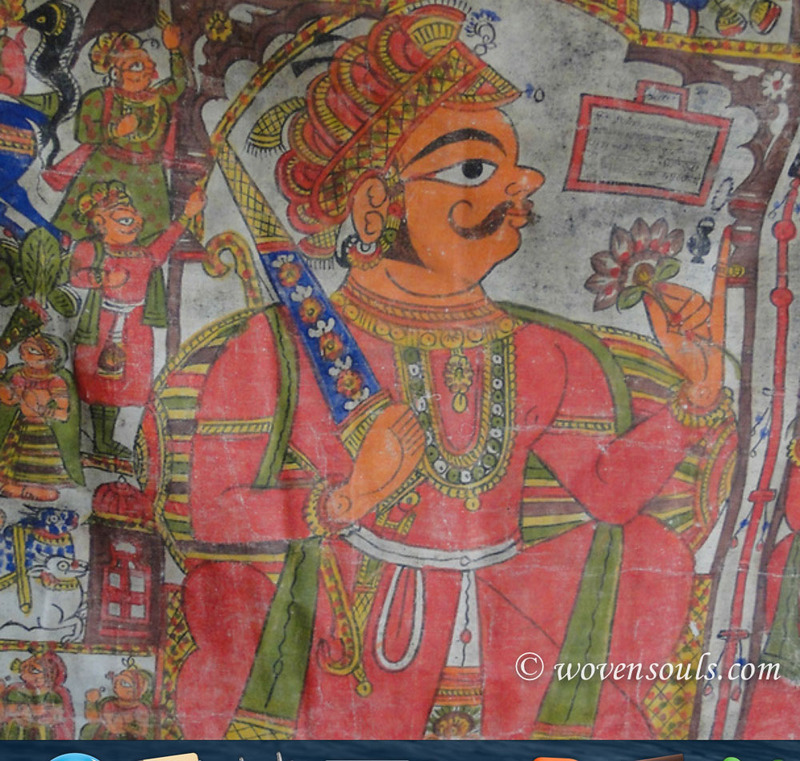 Or maybe they are painted just like the Phad textile in which they are depicted? This reminds me of the jewelry and costumes seen in Angkor. While the patterns are seen, it is impossible to say whether the earrings for instance were real flowers or flower-shaped gold pieces! Just viewing an art piece of such complexity can be such fulfilling way to pass one’s day. Or one’s life. 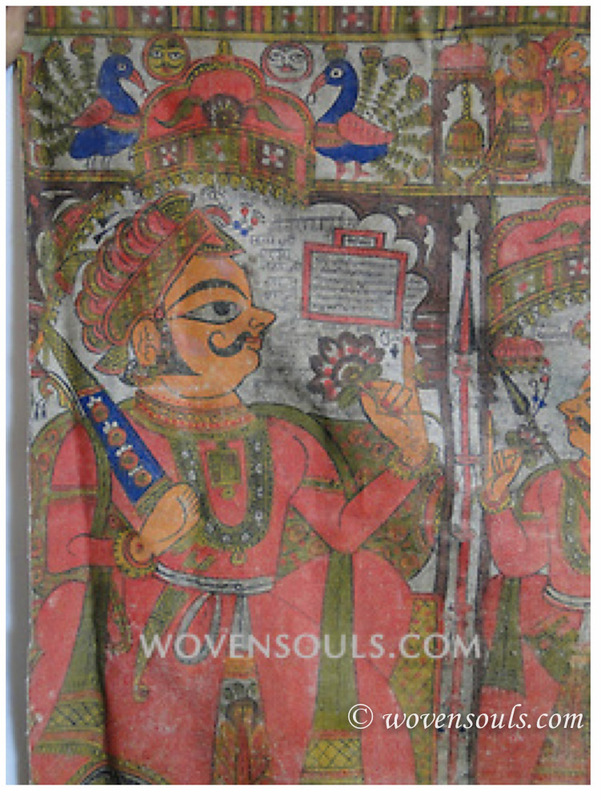 LITERATURE EXAMPLES : Pages 89-90 in the coffee table book ‘Indian Textiles’ by John Gillow & Nicholas Bernard show younger examples of the Phad. 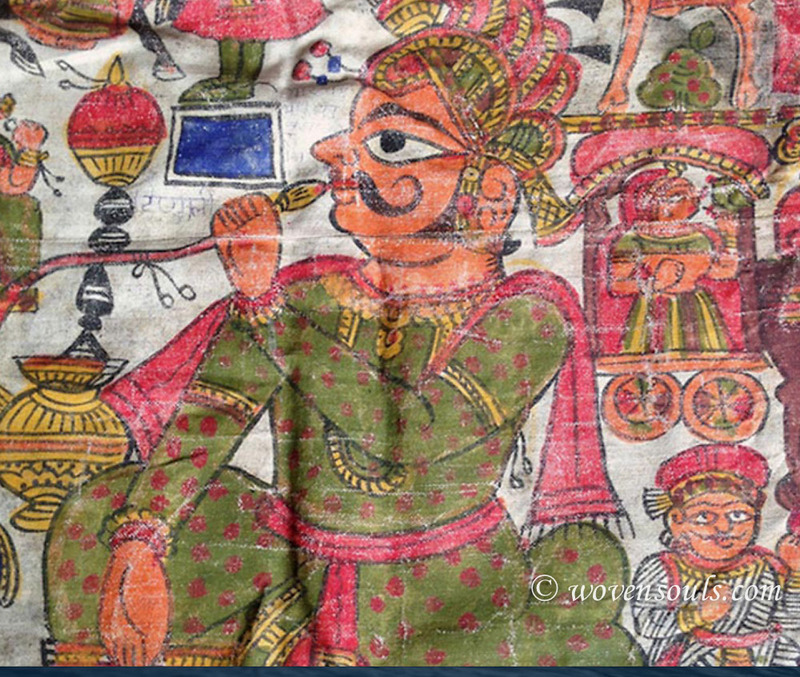 This entry was posted on May 24, 2014 by wovensouls in Art Kaleidoscope and tagged antique, art, Arts, Asia, avintage, beauty, costume, cultural, culture, design, dress, ethnic, folk art, Indian, Indian painting, old, painted textile, painting, Par, pattern motif, phad, Rajasthan, textile, textile art, textile murals, tradition.